Renato Neves (Portugal), Benoit Poitevin (France) and Belen Escobar (Spain) visiting the Lymington-Keyhaven salt marshes in the nature reserve. Bournemouth University (BU) hosted a visit from the national co-ordinators of ECOSAL-Atlantis last week; an EU ecotourism project recording and promoting the heritage of salt production around the Atlantic Coasts of the UK, France, Spain and Portugal. The ECOSAL-Atlantis project goal is to create a traditional salt-working route to highlight the fascinating archaeological and ecologically characteristics of these historic landscapes, thereby encouraging economic success of small-scale salt production and tourism development. BU is the sole UK partner in this project, providing invaluable archaeological and ecological expertise. Researchers are also helping to develop ‘Traditional Salt-working: The Atlantic Route’ and are working with heritage consultants A&A Fielding Ltd to encourage other organisations and sites to join in the creation of the Route. Other partners have been busy completing the heritage inventory of salt working sites, as well as collecting environmental data from coastal lagoons. This last aspect includes work on the eco-system of these fragile landscapes, producing guidelines that will protect them. “This is a highly innovative and original project that brings together archaeology and heritage, ecology and biodiversity, tourism and economic development and forces them to work together in a novel way for the long-term good of these fragile and precious landscapes”. UK national co-ordinator Mark Brisbane, Professor in the School of Applied Sciences at Bournemouth University. During their stay the ECOSAL team visited Poole Museums and Poole Harbour, including Brownsea Island, where they witnessed work taking place in the lagoon, recorded bird species and analyzed factors encouraging breeding and length of stay. Poole Harbour has been an area of salt production from the late Iron Age period (if not before) carrying on into the Roman period, with sites making salt excavated at Ower and Hamworthy. Salt production must have continued into the medieval period around the harbour area but by the 18th century the salt-works were at Lilliput, where they used peat-fired boiling houses crystallising salt from seawater drawn from ponds in what is now known as the Blue Lagoon. 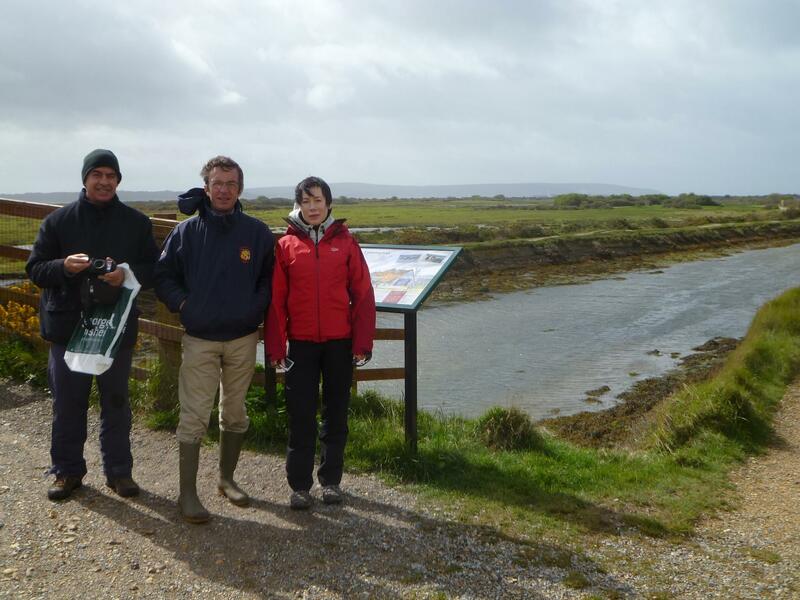 The ECOSAL team also visited the salt marshes in the Lymington-Keyhaven nature reserve, where Hampshire County Council and St Barbe Museum are creating the Lymington Salt Walk. Now a tranquil wildlife haven, 200 years ago this area was the centre of the second most important site for salt production after Liverpool. The land would have been covered by salt pans where brine was concentrated, windmills would have pumped it into storage tanks and boiling houses which then used coal to bring the brine to a low boil in large iron or copper pans, producing salt as the water boiled away. There was also a network of inlets with docks for boats to deliver the coal and collect the salt. The success of this industry directly contributed to the wealth of the town of Lymington and helped to build many of its important 18th and early 19th century buildings. There are 13 organizations involved in the ECOSAL project, from four countries (Spain, France, Portugal and the United Kingdom) as follows: Diputación Foral de Alava, Spain (project leader), Ecomuseé du Marais Salant, France, Centre National de la Recherche Scientifique, France, Communauté de comunes Océan – Marais de Monts, France, Communauté de comunes de l’ile d’Oléron, France, Cap Atlantique, France, Asociación Cultural Amigos de las Salinas de Interior, Spain, Fundación Espacios Naturales Protegidos de Andalucía (Andanatura), Spain, , Bournemouth University, UK, University of Aveiro, Portugal, Aveiro Municipality, Portugal, Rio Maior Municipality, Portugal and Municipality of Figueira da Foz, Portugal. More information can be found on the Bournemouth University website. The image used in this article shows Renato Neves from Portugal, Benoit Poitevin from France and Belen Escobar from Spain visiting the Lymington-Keyhaven salt marshes in the nature reserve. This area was once covered by salt works including boiling houses, storehouses, windmills (for pumping the brine into tanks before being boiled) and docks. The peak of this activity was in the 18th century but declined rapidly in the 19th century as the production of Cheshire rock salt replaced these coastal sites. Photo by Mark Brisbane.